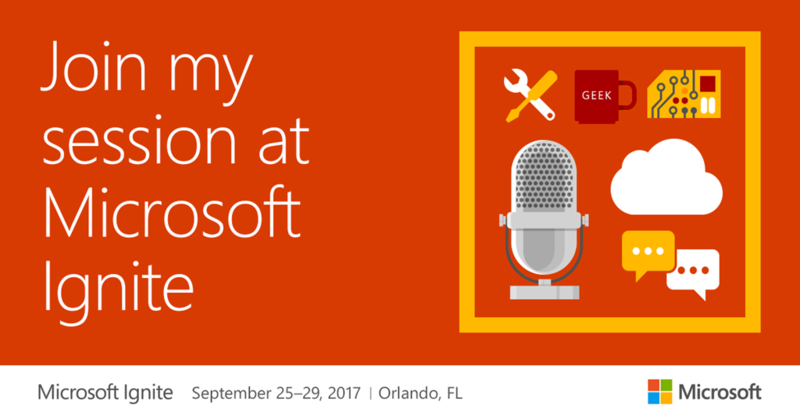 Microsoft Ignite in Orlando starts in a few weeks and I am happy to be one of the many speakers attending Microsoft Ignite. Even this is my second time, I attended the first one in 2015, it is my first time being a speaker at Ignite. If you are coming to Orlando, I am inviting you to join my session on Friday at 9 a.m. about “Azure IaaS design and performance considerations: Best practices and learnings from the field”. Any questions about the session before Ignite? Join the Microsoft Tech Community to start a discussion. Troughout the conference week you can find me from Monday till Thursday at the Expo at different booths like Windows Server in Azure, Azure Compute and Azure Resource Manager. I am looking forward to get in touch with you at Ignite and having a chat about Azure. This entry was posted in Azure, Community and tagged Cloud, Community, IaaS, Microsoft Azure, Public Cloud on 6. September 2017 by Daniel.